We all piled into Debbie’s car and headed off to see the Yuma River Days. Jim decided to stay back. It is a small street celebration with arts and crafts, clothes, food and music. Immediately after parking the car up strolls Chris. We keep running into him in different places/countries. How ironic! We all walked thru the exhibits together and then shortly afterward Chris had to leave. It was a cloudy day which helped to keep temps down a bit, but it was still very hot. 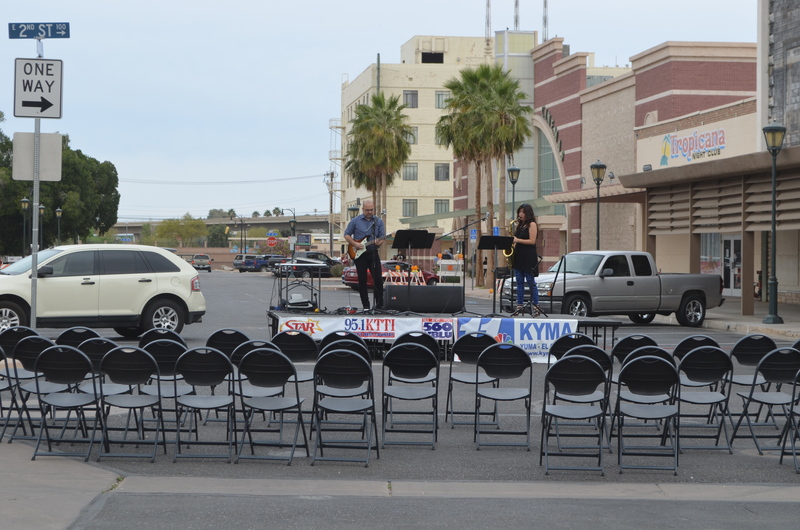 The festival takes place in the old downtown section of Yuma. 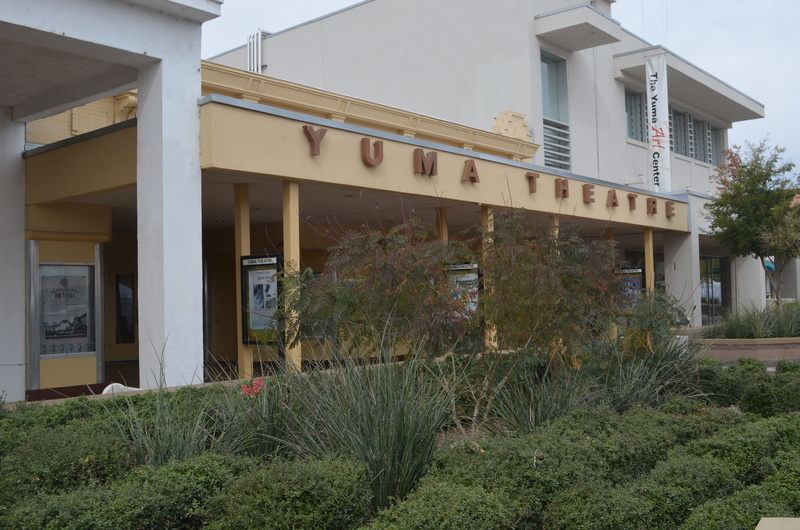 Here is a pic of the historic Yuma Theatre built in the early 1900’s. This used to be an old Casino, but has been changed into a diner. Very Cool!! 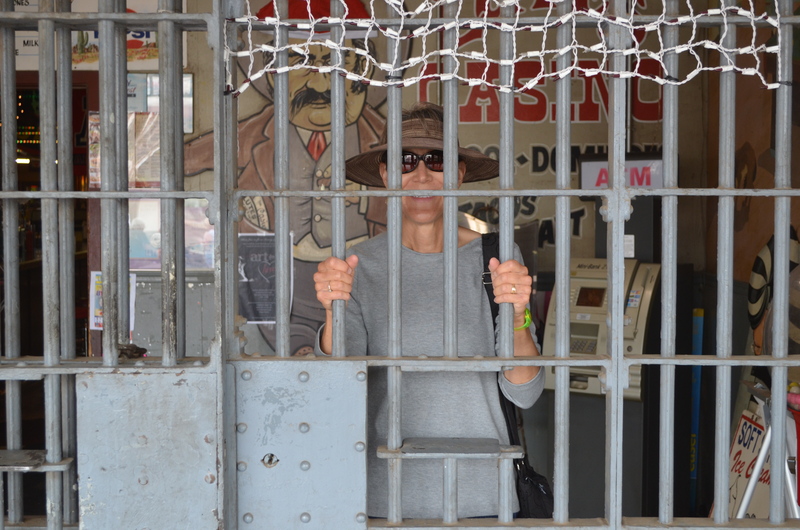 I got this pic of Gayle behind bars. HA!! 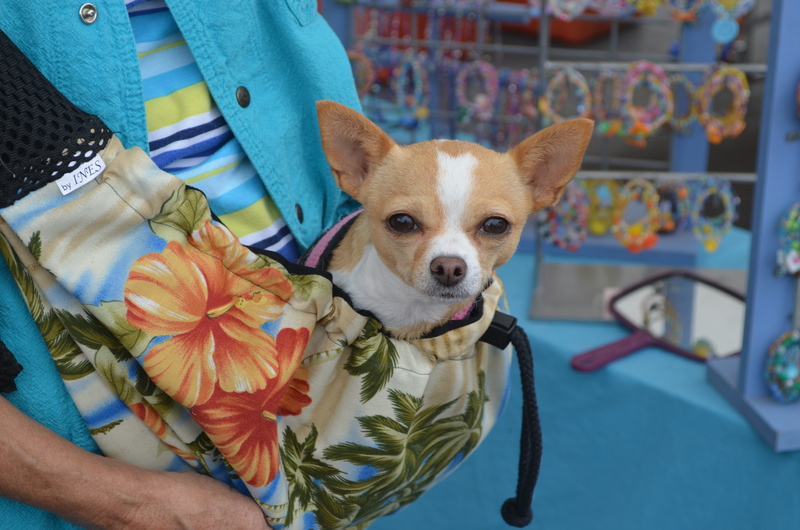 While walking thru the exhibits I saw this lady carrying a Chihuahua that looked very similar to Chica. Too bad I didn’t bring Chica to see if they knew each other. DUH!! I am sure. At the end of the exhibits they had a couple playing music. They were just getting warmed up. 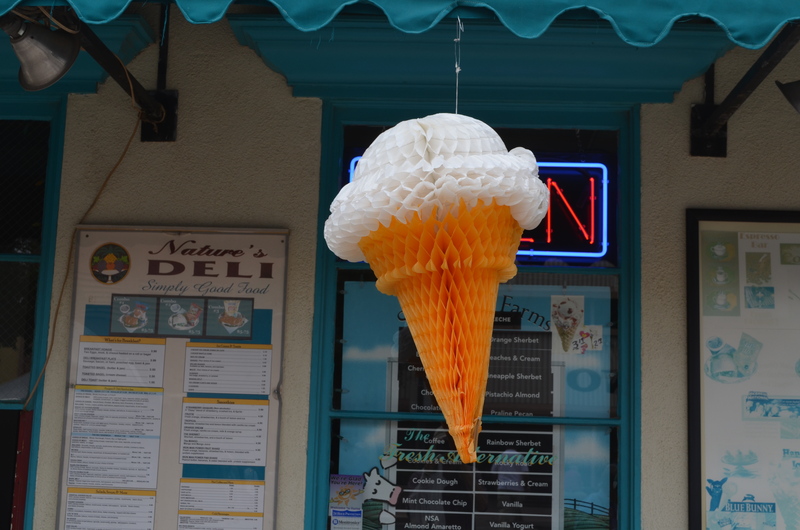 This ice cream cone sure looked tempting. I didn’t get one here but did manage to sneak one in later in the day. Chris had mentioned that there was a flea market much like we experienced in Quartzsite. So off we went. We found a spot where it was a mall atmosphere with many small booths set up inside a big building. Not what we were looking for. 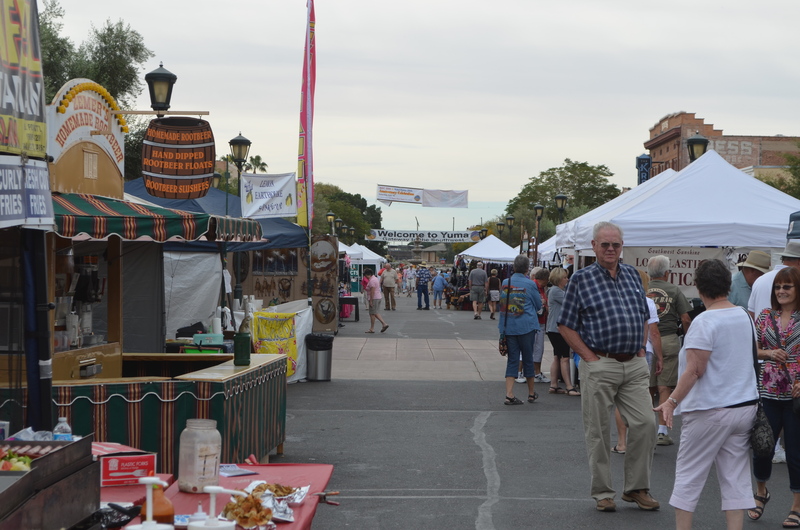 Debbie found out what we were looking for and at 4th and 32nd streets you will find the Arizona Marketplace. Lots of RV accessories, food, hardware, etc. 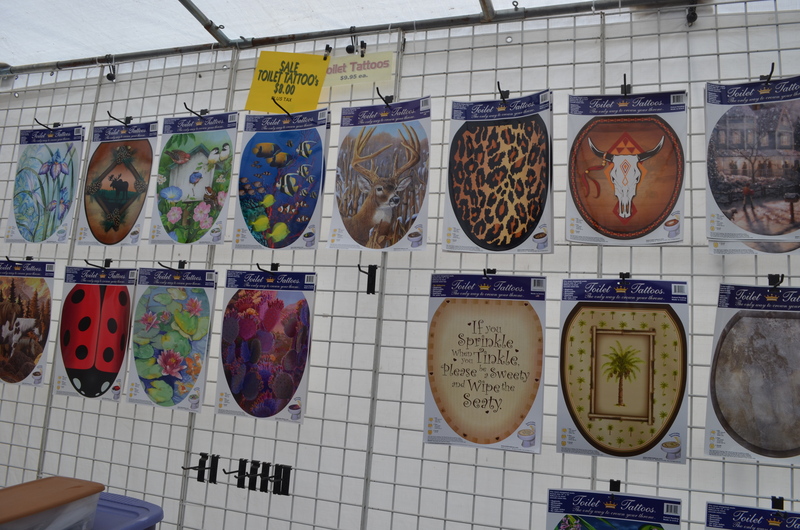 The same stuff we saw in Quartzsite although all the vendors were entirely under a shaded roof. Much cooler. It is only open from Thursday thru Sunday and the admission is only $.50 so we plan to go back some other time. Have you ever heard of toilet tattoos? I never had, but they had all kinds. We finally got tired of wandering through all the stuff and headed home. This was the first day I absolutely had to dump my tanks and take on water. It had been 14 days and felt I really conserved. 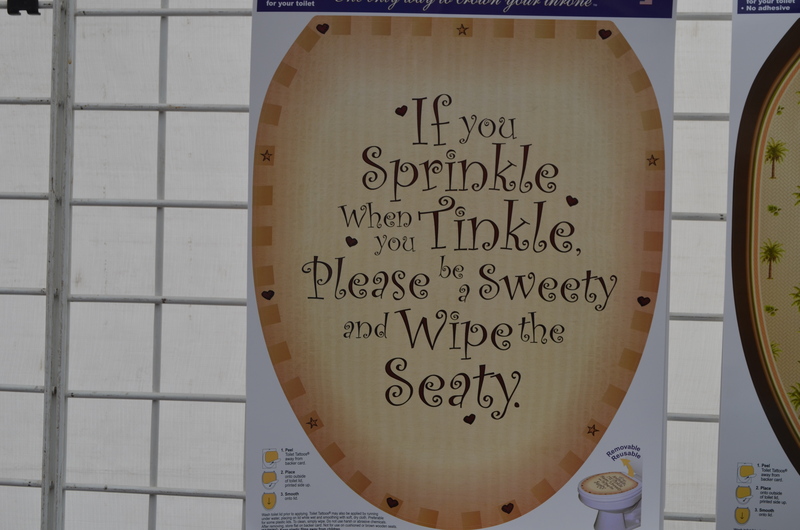 I had to drive 8 1/2 miles to the Laguna RV Park where I had to pay $10 to dump and $5 for water. That is really cheap considering I haven’t paid anything for camping. We all sat around talking and enjoying our beverage of choice and got to experience another beautiful sunset. The sunsets here have really been fabulous. Today I don’t plan on going anywhere except maybe a short walk around the campsite with Chica. No plans means a nice relaxing day. This entry was posted in Arizona, BLM Land, Chica, Friends, Mittry Lake, Yuma and tagged Arizona, Boondocking, Chica, Friends, Mittry Lake by Jim Melvin. Bookmark the permalink. Ice cream always makes a cloudy day sunny! Never ever heard of toilet tattoos! Yes, gorgeous sunsets and you appear to catch them all!! 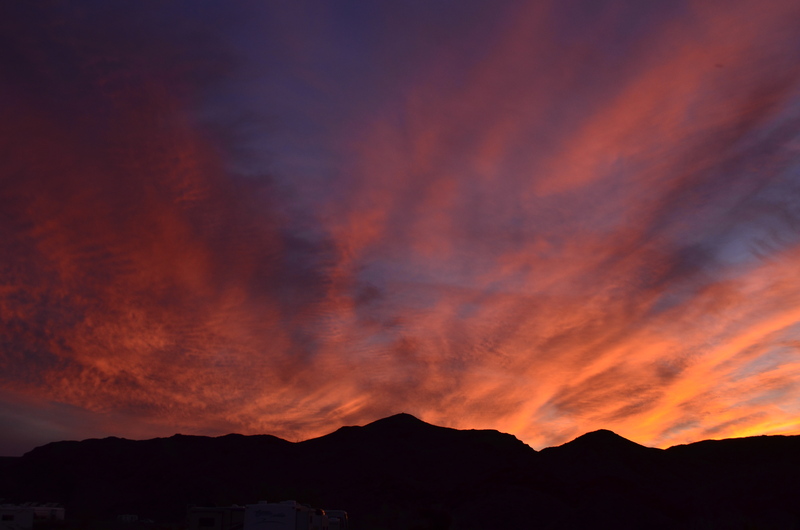 Great pics and looks like great fun in Yuma. Toilet tattoos is a new one on me! 14 DAYS!!! That’s pretty amazing. With the two of us we ought to at least be able to go 7 but we haven’t figured it out yet haha!! 3-4 is about our limit of being without a sewer hook-up. Haven’t boon-docked that much but have stayed with limited hook-ups, which is as brave as we have been able to be. That pup sure does look like Chica.